Join host Robert Forto as he welcomes Eddy Hertelendy to Mushing Radio. 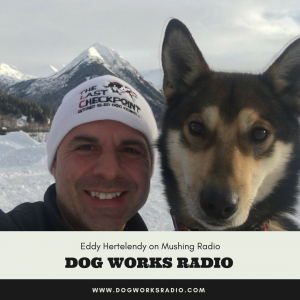 Eddy is a mushing advocate and the owner of The Last Checkpoint. I began my retired sled dog journey in 2015 with Trouble, a multi time Iditarod and mid distance veteran. In my search for a companion I unwittingly discovered the amazing nature of retired sled dogs. A second retiree Piper followed in 2016 and my third Jalapeño in 2017. A fourth will be joining us in early 2018. The future will bring acreage and a facility that will be home to many retired sled dog athletes. Our pack participates in sled dog presentations, frequent trips to the park, recreational mushing and much time relaxing on the couch. What are your thoughts on the animal welfare versus animal rights debate?